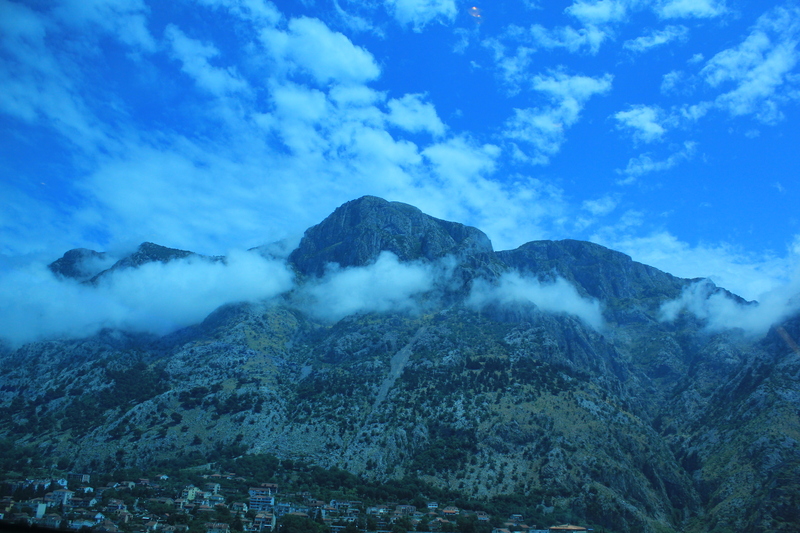 We were told that the cruise into Kotor was spectacular. As you may know if you have followed other cruises that I’ve taken, when I hear this, I really can’t miss it. 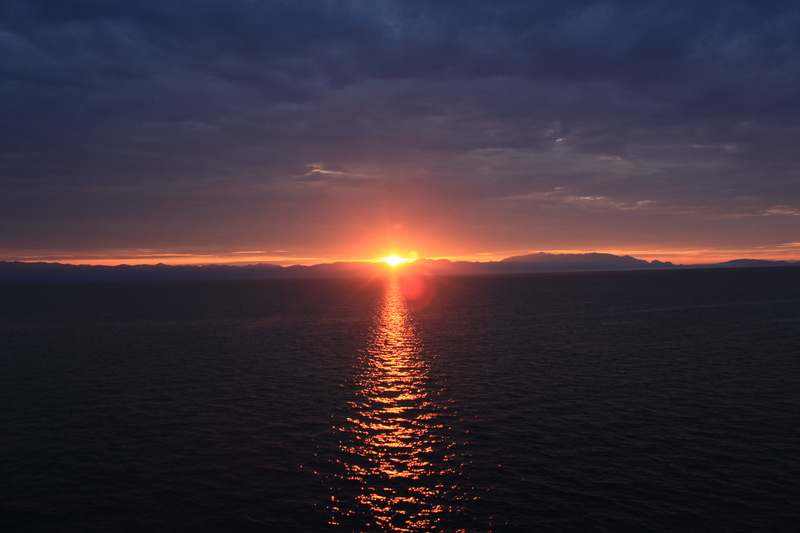 So, I was literally “up with the sun” and got some great sunrise shots over the mountains that make up the fjord-like canyon that leads from the Adriatic Sea to the Bay of Kotor. It was an amazing – and very windy – passage. 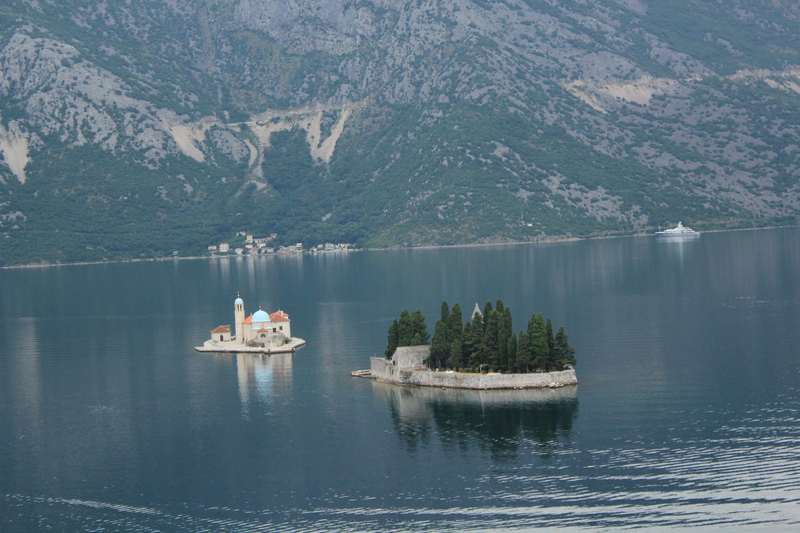 There were at least three islands that had churches. One was more of a ruin, however every July 22 the locals row boats out to this island to through rocks at it, supposedly because it is made from stone (which I thought was a lame excuse – I think the locals are trying to through away their bad luck – that makes more sense to me). The scenery was beautiful. We finally come to the end of this passage – right to Kotor. So, never heard of Kotor? Here is some background. 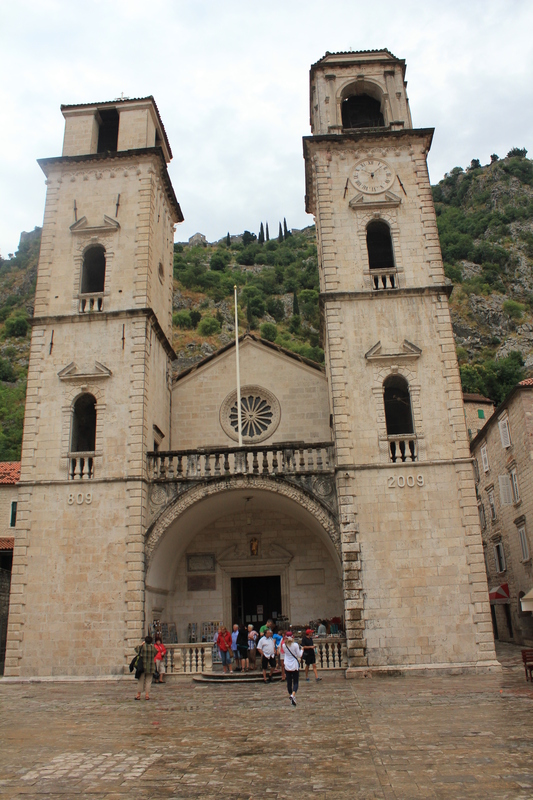 Kotor has been populated by various people since 3500 BC (the Illyrians). Kotor passed through many hands. The Romans claimed it as Acruvium 2 centuries before Christ. It was part of the Roman province of Dalmatia and was under Roman rule until the late 5th Century. Germanic Goths came next – then the Venetians who then the Byzantine Empire, then the Islamic Saracens — then the first Bulgarian Empire (who gave the city to Serbia – they did not like that). 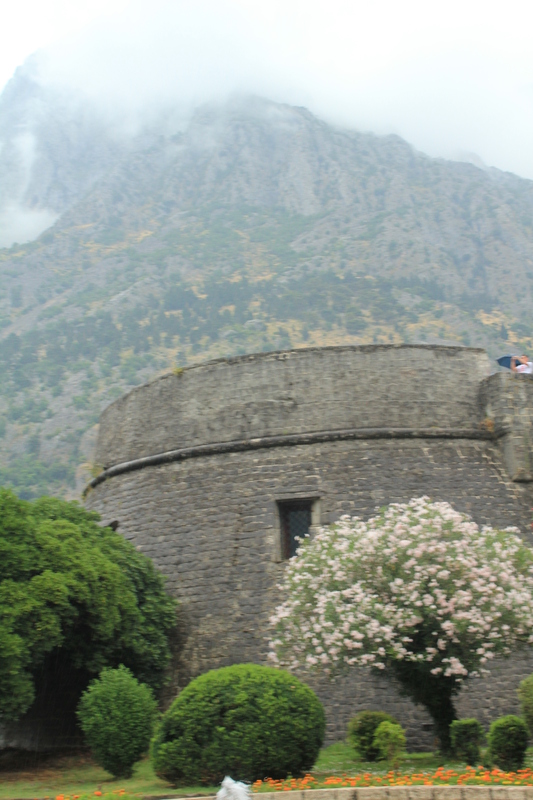 In the 1400s, Kotor was absorbed into the Venetian Republic built the much of the great wall that surrounds the old town (you know how much I love walled cities!). It changes hands several more time: The Austro-Hungarian Hapsburgs, Napoleonic French, the English, the Austrians, Yugoslavia, Nazi Germany (via Italy) during WWII then it became part of the Socialist Republic of Montenegro within communist Yugoslavia. 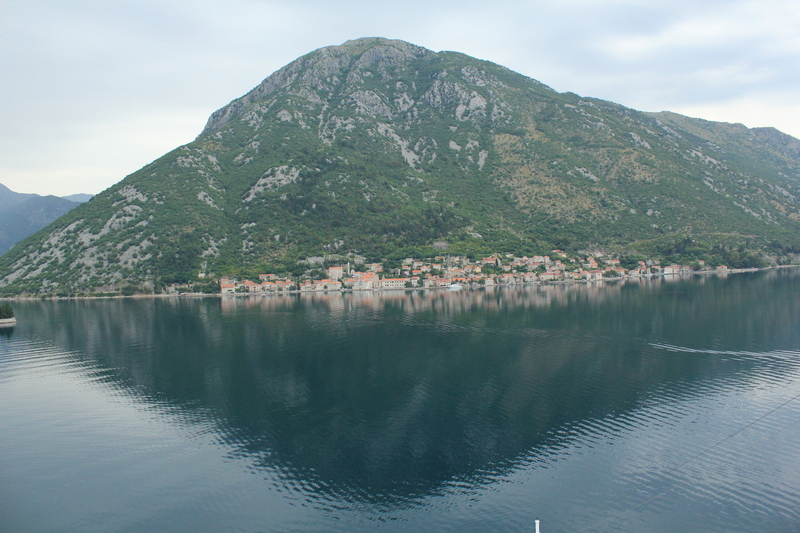 It is now part of the independent country of Montenegro. The port is not large enough to dock the ship, so we had to take tenders from the ship to shore. There was a slow start to this process, but I think I was finally on shore about 10 AM. The old city was just across the street from the port and I was able to enter through the main gate (also known as the sea gate). As you enter, there is a bas relief carved into the wall of the symbol of Venice – the winged lion – more indication of the influence of Venice to Kotor. The next thing you see is a clock tower, which has been destroyed in several earthquakes, however after the last on in 1979, the clock was fixed and it tells time again (something it did not do for almost 3 centuries). 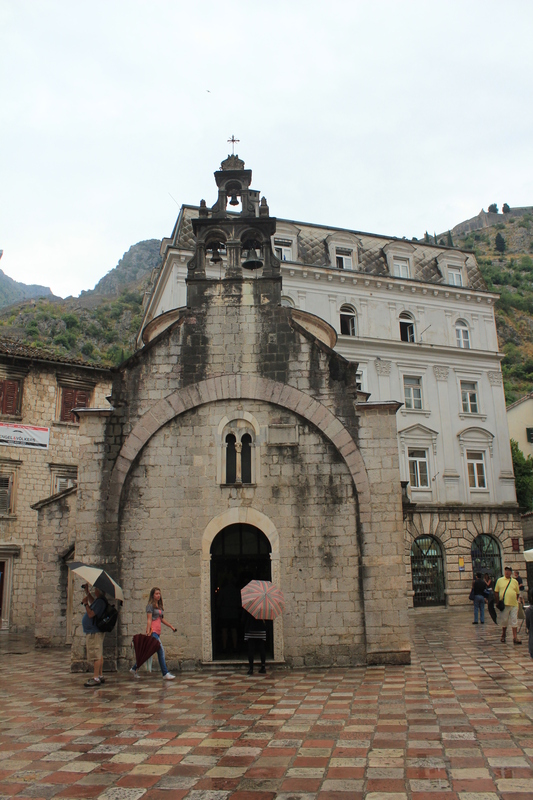 I was able to wind my way around to the next highlight of Kotor: the Cathedral of St. Tryphon. Don’t know who he is? Neither did I, although it appears that he is some sort of martyr – that there are relics from him in the church. It is one of the oldest churches in Europe, dating to the mid-1100s – and built on the foundations of another church – and (surprise) a Pagan Roman Temple. Sounds a bit like the church I visited in Rome – San Clemente – with its foundation built over a Mithraeum. In fact, I think the same could be said for this one – I saw two statues that looked a lot like the torchbearers I saw that the Mithraic Temple. Cool thing about visiting this church, it is an easy climb up to the twin towers and the portico between them! I then wandered through the streets, visiting the Town Fountain (where at one time all the fresh water used by the town came from), the Church of St. Luke (built in the late 1100s) and the Church of Saint Nicola (a Serb-Orthodox church from the 1500s). 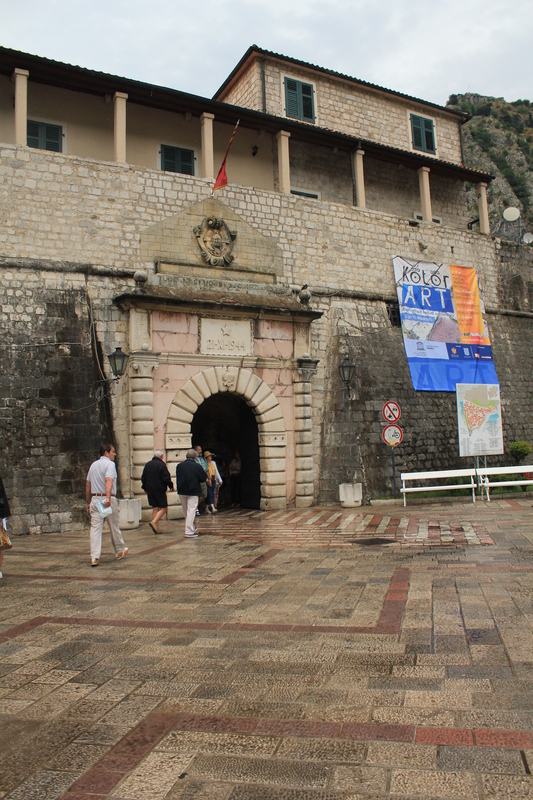 I did not climb the city walls or make my way up the hillside to the Fortress of St. John. Why? It was raining for most of this walk and some the wall is not very safe to walk. I did find the Scorpio patio restaurant and got a nice espresso, though. I also wandered the streets and found some other churches, including this very small one. I decided the just eat a late lunch on the ship and take a nap – my early morning was catching up with me! The rain did stop – and so I got more pictures. I think I told you about St Triphon before? He’s a wine ‘saint’. Depending on when you switched to Gregorian calendar his day is either beginning or middle of Feb (1/2 or 14). You are supposed to at least ceremonially prune one of your grapevines and pour some wine on the cut. Then go drink more wine :). And yeah, I wouldn’t believe they throw rocks because it’s made of rock either. That’s such a blatant cover story type story. Thanks Annelise — I do remember that you told me the story of St. Triphon — and with his St. day falling around the same time as other Dionysian holidays, there is probably some other connections as well. On the platform next to the bell tower, there were two angelic statues — one holding a torch pointing upand the other holding a torch pointing down which is very reminiscent of the torchbearers in Mithraic or Hecate iconography. I love how these things get all jumbled together! Yes, the more of these things you manage to notice (interconnections and echos) the more fun it all is.